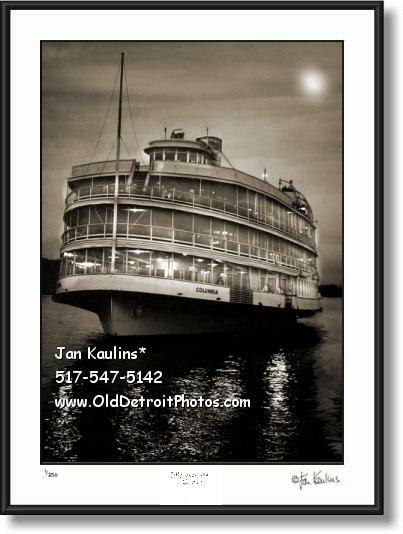 BOB-LO BOAT COLUMBIA MOONLIGHT CRUISE photo picture print photograph for sale. This BOB-LO BOAT MOONLIGHT CRUISE COLUMBIA PHOTO is a vintage historic sepia toned black and white Detroit Bob-Lo Boat photo picture print made from the professionally restored original black and white Bob-Lo Boat Columbia 1940's BobLo Boat negative/photo. It shows the Bob-Lo Boat Columbia on the Detroit River at night with the full moon shining through the clouds above it. It is a wonderful photo of this historic Bob-Lo Boat on its fabled midnight cruise. The band was usually playing during this romantic midnight cruise as the lovers onboard danced the night away beneath the moon and stars aboard the Bob-Lo boat Columbia. Boblo Island Amusement Park was a theme park which ran from 1898 until its closure on September 30, 1993. Its amusement rides were sold in 1994. The park was located on Bois Blanc Island, more popularly know today as Bob-Lo Island, which is part of the province of Ontario, Canada. It lies just above the mouth of the Detroit River.